Stewart Stevenson, SNP MSP for Banffshire & Buchan Coast, is delighted at the announcement that £9000 will be awarded to The Adventure Academy CIC - which will be used to run a forest school in Peterhead for local children. The funding from the Communities and Family Fund will cater for youngsters aged five to eight, encouraging them to explore and learn about the forest around them. Across the country, 17 community led projects are sharing in £136,130 from this small grants scheme which is supported by the Scottish Government and Big Lottery Fund and aims to improve the lives of children eight years and under. In the light of the prospective job losses at Young's factory in Fraserburgh, Eilidh Whiteford MP for Banff & Buchan and Stewart Stevenson MSP for Banffshire & Buchan Coast participated in a stakeholder event which sought to identify a way forward. At the meeting today Young's Chief Executive Pete Ward announced that the company was developing a proposal which would leave their Fraserburgh factory operating but with fewer employees. "The news that Young's are now focussed finding a way to retain the plant is very welcome. The position remains serious but there are some positives from today. "I shall continue to work with employees, company, the Councils and the Scottish Government to achieve the best available outcome." "It is clear that the Scottish Government is taking this situation very seriously. I heard that the First Minister Nicola Sturgeon had a telephone conference yesterday with the union and management at Young's. "And the attendance of two ministers today aided a collaborative discussion which has provided a way forward. "I will continue to support the workers at this difficult time." Banffshire and Buchan Coast MSP Stewart Stevenson has contacted Members of the Scottish Parliament to establish whether there would be support for a formal Cross-Party Group on the Fishing Industry. “It is clear from my conversations with individual fishermen that there is concern about how the introduction of Marine Protected Areas is proceeding. “To date many fishermen's organisations have yet to brief MSPs on their preferred way forward while environmental interests are actively seeking to lobby parliamentarians. “It may now be time to have a more effective forum for ensuring that Scottish Parliamentarians are better informed about issues that matter to the fishing industry." Cross Party Groups in the Scottish Parliament have to demonstrate the support of almost all political parties before they may be recognised as formal bodies. Groups have to have strong standards of openness and accountability before the Standards, Procedures and Public Appointments Committee will grant recognition. “If there is sufficient interest among colleagues in other political parties, we should be able to meet informally in the autumn to plan for the establishment of this new group after the 2016 election. “Fishing needs strong links to Parliament and we have been missing out on hearing the industry's voice. It is not only about current issues, but also about ensuring that the fishing industry and communities who depend on fishing, have a forum where they can voice their concerns at the highest level. Stewart Stevenson, SNP MSP for Banffshire & Buchan Coast, has welcomed the latest Eurostat figures showing that Scotland is in the top two European countries for women’s employment. For the three months from January to March 2015, Scotland’s female employment rate stood at 71.1 per cent, only beaten by Sweden at 72.4 per cent. The UK rate is four places behind at 67.4 per cent. Scotland also had the second-lowest female unemployment rate among the 28 EU countries, at 5.2 per cent, behind Germany at 4.5 per cent. “Improvements across women’s employment, unemployment, activity rates and closing the gender gap have been steady and consistent in Scotland. North of the border continues to be a better place to be a working woman than anywhere else in the UK, and these latest figures confirm that we are performing better than the majority of the 28 EU countries. “I am delighted at these new statistics from Eurostat and they reflect the commitment of the Scottish Government to lead the way on 50:50 gender representation on boards, give young people real hope and prospects for employment and a career, and champion a true living wage. “Breaking down traditional barriers takes time but measures that ensure the playing field becomes more truly equal over time is essential for a Scottish workforce. Stewart Stevenson, SNP MSP for Banffshire & Buchan Coast, has congratulated pupils at Banff Academy who along with five other North East schools raised a total of £22,000 through the Jasmine Charity Challenge. The Jasmine Charity Challenge is a private sector funded initiative that challenges secondary school student teams from the North East to choose a charity and identify enterprising ways to raise a minimum of £1000. The Jasmine Group also gives a £250 donation to each school. The youngsters attended the finale event of the Jasmine Group initiative at Cineworld in Union Square in Aberdeen. An individual from each school presented the results of their year-long fundraising campaign, while each participant was given a pupil of excellence award to mark their contribution throughout the past 12 months. “The pupils have shown fantastic dedication to the Jasmine Charity Challenge over the past 12 months and their enthusiasm has been great to see. The annual ‘Festival of Politics’ to be held in Holyrood next month will feature a famous son of Fraserburgh, James Ramsay, and his role in the abolition of slavery. Banffshire & Buchan Coast MSP Stewart Stevenson has welcomed the discussion at the event, which will feature a lecture from noted historian Professor Tom Devine on Scotland’s role in the slave trade. James Ramsay was born in Fraserburgh in 1733 and after studying at King’s College and training as a surgeon in London, joined the British Navy where he encountered at first hand the appalling conditions of slaves in the West Indies plantations, which had a profound effect on him. “While Scotland likes to promote its role in the abolition of slavery, the uncomfortable truth that Scots were also involved in the earlier exploitation of the practice has been somewhat erased from our history books. What was the real role of Scots in the slave trade and what was the legacy? The event takes place on Friday 14 August and more details can be found at http://www.festivalofpolitics.org.uk/whats-on/. “The local statistics for the Buckie Travel-to-Work Area are good news and very encouraging, highlighting the fact that the action the SNP in Government is taking is protecting jobs and helping more people into work. “Buckie has not had its troubles to seek in past years, so it’s good to get some positive news on the employment front. “Scotland is the only nation in the UK where unemployment fell between March and May this year – in the UK as a whole, unemployment rose to 5.6 per cent. “It is also positive to see youth employment at a record high for the March-May period. Despite difficult economic circumstances and cuts passed down from the UK Government, the SNP has taken action at every turn to ensure young people are able to fulfil their potential in education, work or training - and since coming to power the number of Modern Apprenticeships has increased by almost 60 per cent. Local MSP Stewart Stevenson has said a response he has received from Aldi Stores on the controversial Kirkburn Mill site in Peterhead is “extremely encouraging” and represents real progress towards finally seeing the site developed. The SNP MSP raised the issue of the Kirkburn Mill site with the Chief Executive of Aldi recently following continued local concern at the condition of the site. “I am very pleased that Aldi have responded in these positive terms. This has been a long-running issue involving a prominent site at the entrance to the town centre. “We’ve just had the opening of Buchan House, which has consolidated council and other public services onto one town centre site which was also very much in need of development. This brings a workforce of several hundred right to the edge of the town centre which can only be good for local shops and services. Banffshire & Buchan Coast MSP Stewart Stevenson has hailed figures released today showing the number of people on Modern Apprenticeships in the Aberdeenshire council area has grown by over 75 per cent since the SNP came to office in 2007. Mr Stevenson is repeating calls made by Scottish MPs in Westminster for powers over the minimum wage to be devolved to Scotland to allow action on fair pay for apprentices. An analysis of figures from Skills Development Scotland shows the number of Modern Apprenticeships in Scotland overall has risen from 15,803 in 2007/08 to 25,247 in 2014/15 – an increase of 59.7 per cent. The SNP in government has exceeded its target of 25,000 Modern Apprenticeships a year every year since 2011/12 – and has increased the target to 30,000 a year by 2020. The current minimum wage for apprentices is £2.73 per hour - while under plans put forward by the SNP at the General Election, the rate would have risen to £6.86 by 2020. “These very welcome figures for the North-east highlight a key success of the SNP in government – with the number of Modern Apprenticeships rising by almost 60 per cent since 2007/08 and more young people being given an opportunity to get into work, learn a skill and secure a better future. “Apprenticeships are a key part of the SNP in government’s successful youth employment strategy – and the Scottish Government has exceeded its target of 25,000 Modern Apprenticeships a year every year since 2011/12. This target is set to increase to 30,000 by 2020. “However, it is simply wrong that due to the discriminatory regulations of the UK Government, many apprentices could find themselves earning less than £3 per hour. “It’s absolutely vital that we can continue to attract more young people into the Modern Apprentice programme – and that they aren’t put off by the disincentive of low pay. That’s why it is absolutely vital that powers to tackle low pay are devolved to Scotland. 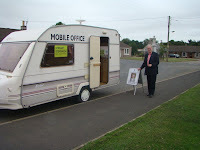 Stewart Stevenson visited the Post Office in Inverallochy this week to take his turn on the new piece of technology which is the talk of the town. The robot kiosk, developed in an Aberdeen University research project, is enabling residents to speak with pharmacists in Fraserburgh via webcam and receive medicines dispensed straight from the machine. The trial examines how better services can be delivered to rural areas. Should the trial be successful, similar schemes could be rolled out in other parts of Aberdeenshire and across rural Scotland. The robotic kiosk, which cost around £150,000 to develop, allows customers to speak to a pharmacist at Bairds Pharmacy in Fraserburgh via webcam. The kiosk is filled with a range of prescription and over-the-counter remedies which can then be dispensed as necessary. “Rural communities sometimes struggle to retain local amenities so this trial is a very important step in ensuring that such vital pharmacy services can be provided locally and efficiently. It is important to our health, and to the health of our rural town centres, to have facilities on our doorstep. Banffshire & Buchan Coast MSP Stewart Stevenson has highlighted figures which show that countries ranked highest for workers’ rights also have higher productivity than the UK. These figures underline the folly of the UK Government’s plans to restrict trade union rights and strengthens the case for full powers over employment law being devolved. According to OECD statistics the vast majority of EU countries, including Germany and France, ranked best by the International Trade Union Confederation (ITUC) for workers’ rights have higher productivity than the UK. Eleven members of the EU are top rated for workers’ rights by the ITUC – the UK is ranked in the third highest category of country. This also follows research highlighted by the SNP on Friday which shows that Scotland is leading the UK on R&D (research and development) spending through universities – highlighting the case for devolving economic powers to foster greater innovation. “The Tories' desperate claim that they are the workers' party will stick in the craw of working people in Scotland - where the Tories are scarcely anybody's party, having got their lowest share of the vote since 1865 at the general election. This is a government which has restricted access to Employment Tribunals and plans ballot rigging restrictions on the right to strike – it is no friend of working people. “Now we know that their attack on workers’ rights is not just morally wrong but will also undermine economic progress and hamper efforts to tackle the UK’s poor record on productivity – something the Chancellor has supposedly made a key priority. “We cannot allow the UK Government to damage industrial relations and hold back our economy in this way. The UK Government must listen to the calls made by the STUC and the Scottish Government for the devolution of employment law. 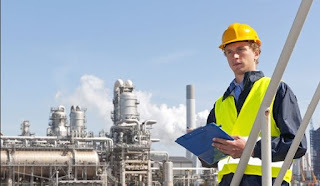 UK - The UK is ranked in the third top category for workers’ rights and productivity is $48.50 as measured by GDP per hour worked in US Dollars for 2012. 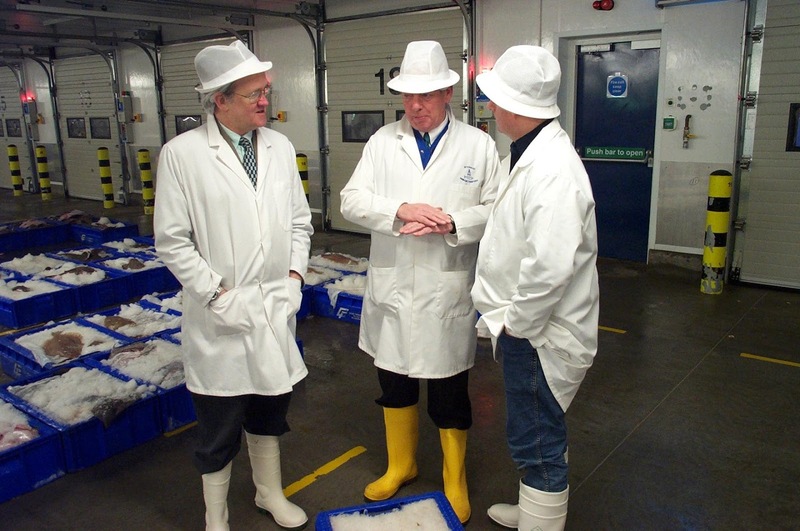 Following last week's announcement by Young's Seafood that it was evaluating options for its Fraserburgh site, local MP Eilidh Whiteford and MSP Stewart Stevenson have visited the factory to show support for staff there. The local representatives visited the factory on Monday morning and met with a cross-section of the Young's workforce, including trade union representatives. During the meeting, the employees voiced their concerns about the potential exit of the company from Fraserburgh and heard of the efforts that the local MP and MSP are undertaking to keep jobs in the town. "It is welcome to meet with staff and have the opportunity to talk with them about their future and what we can do to help, as their local representatives. "The employees at Young's in Fraserburgh are highly skilled and care passionately about their work. We all agreed to work together to keep jobs in Fraserburgh." "We are determined to keep as many jobs in Fraserburgh as possible, and we continue to work with the company, the local Council and the Scottish Government to try and secure a future for this factory." 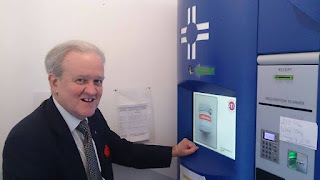 Stewart Stevenson, SNP MSP for Banffshire & Buchan Coast, is encouraging constituents to help save a life this summer by donating blood before they go on holiday. The Scottish National Blood Transfusion Service must maintain up to a week’s supply for all eight blood groups in Scotland and supplies often see a drop during the summer months, particularly as people travel overseas. “The people of the North East have always been generous blood donors. This generosity has ensured that blood stocks remain at a healthy level and that our health service is getting the support that it needs. “We can all help the Scottish National Blood Transfusion Service by knowing what blood type we are and by keeping an eye on what particular blood groups are experiencing a shortage of supply. All blood groups are encouraged to donate, but donors are currently needed for the blood groups B negative and O positive in particular. “I can assure any first time donors that staff always do a great job of making the process quick and comfortable. "What these figures actually reveal is that the local police receive nearly 600 '999' calls every week and less than a dozen of those are hoax calls or malicious intent or some other reason which results in the call being filtered out and police attendance deemed unnecessary. "That's still over 580 calls each and every week where our local police provide an emergency response to those in genuine need. 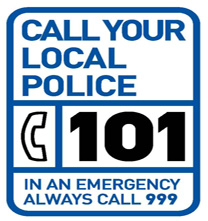 We've all heard of stories on the news where people, for a variety of reasons, call 999 when it really isn't necessary and the clear message from these figures is that people should call 101 for all non-emergencies." Banffshire & Buchan Coast SNP MSP Stewart Stevenson has announced details of his forthcoming surgery tour of local communities which commences on Tuesday 14 July. This year will be the fifteenth such tour that Mr Stevenson has undertaken, covering 37 communities from Rothiemay in the far west to Boddam at the south-eastern end of the constituency and inland to Aberchirder, New Byth and Memsie. 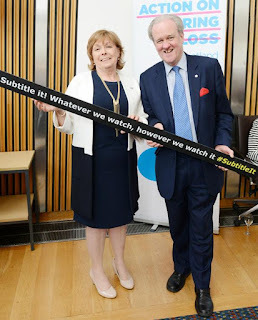 Stewart Stevenson, SNP MSP for Banffshire & Buchan Coast, has lent his support to the ‘Subtitle It’ campaign from charity Action on Hearing Loss – calling for subtitles to be included on catch up TV. There are 10 million people with hearing loss in the UK, and thousands rely on subtitles to follow dialogue and plot in a TV programme. TV on demand and streaming services are increasingly becoming the normal method of viewing TV, but almost all of this is inaccessible to deaf people due to the lack of subtitles. “The way that we watch TV has been completely transformed over the past few years with many people now choosing to stream film or watch catch-up TV in their spare time. Stewart Stevenson, SNP MSP for Banffshire & Buchan Coast, has welcomed official statistics that show a drop in homelessness figures across Aberdeenshire. The number of people who are homeless has fallen for the sixth consecutive year, thanks to a national approach to prevention. Across Aberdeenshire, the number of applications under the Homeless Persons legislation has fallen from 1288 to 1180 between April 2014 and March 2015. New statistics recording prevention also demonstrate that the Housing Options approach has been the reason for homelessness consistently falling. The number of Prevention Approaches applications has fallen from 195 to 110 between April 2014 and March 2015 in Aberdeenshire. The role this approach has played in reducing homelessness applications across Scotland has been evidenced through the PREVENT1 recording system. The figures show that where a person had been referred to the scheme due to a reason involving possible homelessness, only 45 per cent went on to apply as homeless in 2014-15, suggesting that the Housing Options approach may have prevented homelessness for up to 55 per cent of applicants. “These new statistics show that the Housing Options service is responsible for the fall in homelessness applications, and I am delighted that these are falling across Aberdeenshire. “Housing is at the heart of the Scottish Government’s ambition for a fairer and more prosperous country, and preventing people from experiencing the misery of homelessness is a priority. The Empty Homes scheme was recently launched and the Scottish Government is currently at 90 per cent of their commitment to deliver 30,000 affordable houses during the lifetime of this Parliament. They will also be looking at private rented sector reforms following a countrywide consultation – further helping to prevent homelessness in Scotland.